Stronglight’s ST 55 is one of those components that does exactly what is says on the tin, sure it’s the workhorse of the range but a great choice for moderately geared town hacks and budget fixer/singlespeed conversions so long as you’re the lighter side of 80 kilos. Non detachable rings, old fashioned square tapers and bog standard 170mm arms won’t set anyone’s Lycra ablaze and the arguably limited ring choices demand a more creative approach to gearing. However, this keeps costs low and there’s a lot to smile about, if only the knowledge you’re saving a more expensive crankset from a spanking. Emerging from the box, the lightweight polished arms and CNC machined anodised ring belie their modest price tag. Sure, flip them over and the finish is a little more workmanlike but there’s something very satisfying about a purely functional component that can be cheerfully run into the ground at nominal expense. However, Dural’s a relatively cheap alloy chosen for its low weight and this shows-especially climbing out of the saddle and dancing on the pedals/sprinting for the lights - you can feel the flex. Curiously, Stronglight recommend a bottom bracket length of 119mm- ample for an mtb frameset with snake-stays but 107mm axles are more realistic for an accurate chainline on most fixer/singlespeeds irrespective of whether they are purpose built or road conversion. Similarly, while the ring is anodised, past experience suggests the arms are prone to corrosion but having amassed huge mileages on an identical model, periodic hard paste waxing keeps Joe rot and his friend the salt monster firmly at bay. The slightly restrictive choice ring choice (38 to 46 in two-tooth increments) is adequate for small-wheeled folders and possibly for juniors turning moderate winter gears in hillier regions but a broader range of say, 34 to 52 teeth would offer greater versatility and broaden the appeal.
" The 55 series is the workhorse of the Stronglight range of chainsets and represents excellent value". A fair statement and one I would agree with. CNC machined, anodized alloy ring 38-46 teeth (46 as tested), square taper fit, 170mm Dural alloy arms. Generally not bad, just lacks refinement in places. Experience suggests it's better than might be expected but remember I'm 70 kilos and once the ring's worn, it's time for a new crank. However, this is reflected in the price and you should recoup the investment many times over. 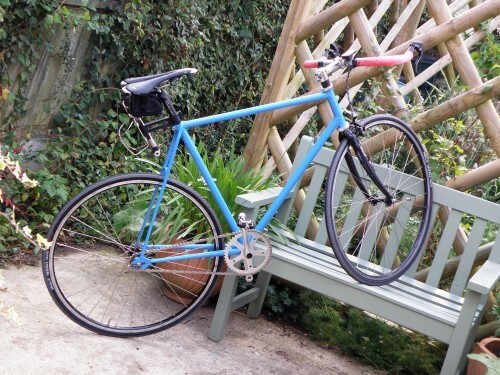 Cheap but cheerful is the way I'd describe Stronglight's 55. It looks quite pretty and polishes up pretty well. However,there's some discernable flex when powering up the climbs-especially riding out of the saddle. That said in many respects it's ideal for town hacks and fixer conversions, although modest ring sizes might rquire some creativity when it comes to gearing. Quite pretty for the asking price but cheap enough so you won't worry about it. Nothing given the price but wider choice of rings would broaden the appeal.